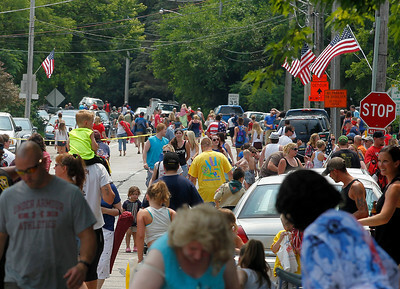 Matthew Apgar - mapgar@shawmedia.com Hundreds line Blivin Street for the annual Independence Day parade and celebration on Saturday, July 4, 2014 in Spring Grove. Matthew Apgar - mapgar@shawmedia.com Parade participants toss candy from atop a firetruck on Blivin Street during the annual Independence Day parade and celebration on Saturday, July 4, 2014 in Spring Grove. 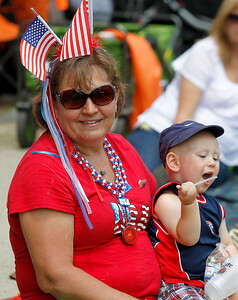 Matthew Apgar - mapgar@shawmedia.com Cheryl Johnston of Spring Grove holds her grandson, Landon Jungmann of McHenry, 1, as they watch the annual Independence Day parade and celebration on Saturday, July 4, 2014 in Spring Grove.